There are many ways to transform your yard using plants but creating a new hardscape can truly create a dramatic difference. Let’s explore some possibilities for all budgets. You May Be Wondering What Exactly Is Hardscaping? Hardscape refers to all the hard structures in your yard such as the patio, a concrete retaining wall, a wooden deck, the driveway and surprisingly any water features as well. Basically anything that is made of hard materials and is built to last. Changing things like patios, decks, and driveways can be very expensive to do and it is important that they are done correctly. However they can add value to your home by creating an eye catching feature that creates curb appeal. The Number One Hardscape Upgrade for San Diego Is Patios. What can be more pleasant than relaxing on your patio with your family and friends. The biggest perk of living in San Diego is how much time we can spend outdoors all year. A patio can change the way you experience your yard. It can combine features such as your pool, a sitting area and a fireplace. Even on our briskest nights in San Diego a fireplace makes it possible to enjoy your outdoor space year-round. Because of drainage issues, weatherproofing, and the need for a solid foundation that will not shift as the years go by, I highly recommend that you get a professional to help you with your dream patio. The investment will pay off both in worry free use and in resale value. It is impossible to talk about curb appeal without mentioning the curb. Your front yard is people’s first impression of you and your home. Luckily it is much simpler here to find low-cost ways to enhance your curb appeal. Make a change in your front yard by basket weaving recycled bricks to create an inviting pathway to your lovely home. You could also create a path using flagstone and fill in the space between with gravel or ground cover plants. Many stone materials can be reclaimed making this economical as well is beautiful. Try to use a material and a pattern that matches your home. Too many patterns, colors, and materials can make your home look busy and distracting. This is also why it is important to consider how you want your whole space to look when planning a hard skipping project. You don’t want to create a patio that is later in the way of the pathway to the pool that you want now. As the Internet isolates us more and more from real human interaction there is a trend among homeowners to make their front yard a place to relax and interact with your neighbors. By creating a front yard space such as a half wall around a lovely table and chairs underneath a large tree, you invite your neighbors to stop and interact building community ties. The third high-impact Hardscaping change you can make to your San Diego yard is a water feature. When most people think of San Diego they think of the ocean. You live here for a bit though and you realize that water is scarce. For this reason I definitely do not recommend having any kind of a large water feature. Fountains do not use as much water as you would think though. They recycle their own water and the water loss that there is comes from evaporation. So periodically you add some more. A water wise way to do this is to collect the first bit of cold water that comes out of your shower and pour that into the fountain. Fountains are so versatile as a hardscape option that they can suit almost any space and look. They can create a grand looking entrance or bring life to a hidden nook. No matter where you put a fountain people are sure to be drawn to it as the sound of running water comforts and revives the human soul. The fourth high-impact hardscape design choice for San Diego is the driveway. I definitely do not recommend doing this yourself but if you can afford a new driveway it is one simple change that can revive any property. From asphalt to concrete to glass (yes glass – check it out its low maintenance and eco friendly) there are many materials to choose from when picking a driveway. The only type I do not recommend for San Diego is the grass driveway. When I was landscaping I saw so many of these and our grass grows in spotty sometimes. These are best left to environments in which grass grows easily because they are quite the eyesore when they are bare. If you wish to create a patterned look try brick or cobblestone. You may be thinking that they’re too expensive but you can use them to outline your driveway with an interesting pattern. You could also build a small retaining wall along your driveway using stones. The fifth high-impact hardscape design for San Diego yards would be fencing. There’s a reason for the saying good fences make good neighbors. Fences are usually used to create barriers but can be installed with an aesthetic sense. For those of you on a budget a simple lattice screen can help hide your HVAC system. Or the hot tub where your neighbors sit naked. Grow vines and weave them through the lattice for an even more solid and eye catching screen. Vines both look and smell beautiful but remember that they like to spread so you may want to plant them in a pot next to the screen. Make sure that you make the lattice sturdy enough to hold the weight of the vine and opt for an evergreen variety. Some homeowners enjoy the look of a large fence surrounding their property. They like the benefits of it’s obvious message to keep out of their yard. For those of you who want a more welcoming look they make small white picket fences that can be used to outline your yard. These can look and smell beautiful with the addition of a fragrant climbing rose. Whatever you decide to do with your hardscape project the most important thing to remember is to create a flow of patterns and materials and not to overwhelm your senses. Like my mom used to say when she taught me how to put on makeup sometimes less is more. 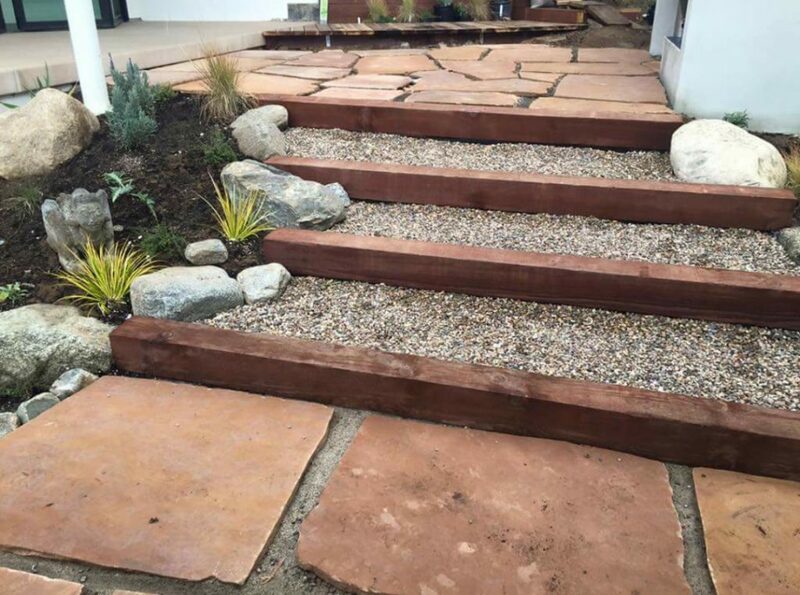 This entry was posted in rocks landscape. Bookmark the permalink.